The first half of the 20th century was rocked by two of the deadliest wars ever to have been fought. On July 28, 1914, the major powers in Europe and the world were drawn in to The Great War, later known as World War I. The catalyst for the war was the assassination of Archduke Ferdinand of Austria, but imperialistic foreign policies and a complex network of treaties in Europe were the underlying causes. World War II began on September 1, 1939, when Nazi Germany invaded Poland. Resentment of the Treaty of Versailles and intense nationalism in Germany led to the Second World War. In both wars the United Kingdom swiftly declared war on Germany. Thus, Canada, a member of the British Commonwealth, was brought in to the massive conflicts. 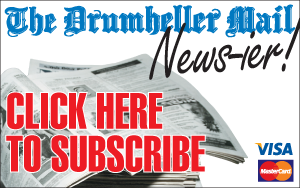 Men from the Drumheller Valley, a still young community, bravely enlisted to go overseas. The first volunteer in World War I was W. S. Cameron, who joined the Canadian Army Medical Corps in late 1914, and was drafted to the Eight Field Ambulance Unit in 1916. Willard Sandercock, a prominent lawyer in Drumheller for 49 years enlisted. In August of 1915, he journeyed to France as a Staff Sergeant the Cavalry Ambulance, and later as a Lieutenant in the 9th Field Battery, 10th Brigade. Lt. Sandercock returned home after being injured by a shell in October, 1918. After the war, he enjoyed the camaraderie of fellow veterans and regaling anyone who would listen with tales from the war. Many miners enlisted as well and, because of their mining experience, were given the role of sappers. “They knew how to dig and knew about explosives,” said Linda Digby, Director of the Atlas Coal Mine. Sappers, otherwise known as combat engineers, have a wide variety of duties, but generally are known for being experts at demolishing enemy fortifications. In World War I, sappers had the hazardous job of digging a tunnel from their own trench to below the enemy, placing explosives, and detonating them. In World War II, Drumheller once again rose to aid the Allies, both on the field and off. Once again many men wished to go overseas to fight against the aggression of the Axis powers. Coal was vital to the war effort and the mines in the valley were producing record tonnage of coal. Mines were hiring new miners as fast as they arrived in town. Miners were able to work all they wanted and make the money they had dreamed of when they first came to the valley. Lorraine Patrick, son of Dr. Omar Patrick and owner of the Atlas Coal Mine at the time, was given the rank of Brigadier and was in Ottawa during the war as an advisor for industrial efficiency. 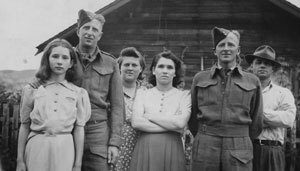 The Ladies Auxiliary to the Royal Canadian Legion was also active during World War II. The ladies would visit wounded veterans and send care packages containing hand knitted garments and various other items to soldiers. Many of those who went overseas to fight in the wars were sadly never to return. Alfred James Briggs fought in World War I. 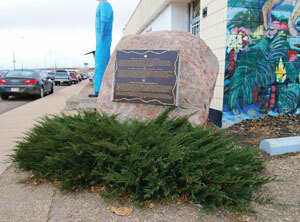 He survived the fighting and moved from England to Drumheller in 1919. Briggs worked as a fireboss until March 1940 when he decided to journey out to Montreal and enlist in the Merchant Navy. A year later Briggs was lost at sea. The heroism of all those who fought and continue to fight will live on in the hearts of the nation. On Remembrance Day, November 11, we pause to respect their noble sacrifice. Most of the families that flocked to the Drumheller Valley during the early part of the 20th century came to make a living off the booming coal mining industry. Miners put on their equipment and were thrust in to the dark, cramped confines of the mines. However, the mines were filled with danger. Toxic gases could silently subdue miners or flammable fumes and the coal itself could cause an explosion from the smallest of sparks. Unfortunately the mines were not completely safe, but to aid miners in trouble, the mine rescue teams bravely put their lives on the line to help those in need. There were many mine rescue teams present in the Drumheller Valley. To be a part of mine rescue there were a couple skills you needed. First, was being certified for first aid. Secondly, you had to give up an evening or Sunday every week to attend mine rescue practice. One of the most famous and tragic instances of mine rescue occurred at the Monarch Mine on July 27, 1941, as detailed in the previous installment of Stories of the Century. While attempting to rescue three miners, Harry Crowder succumbed to toxic gases and perished in a valiant attempt to help the Monarch miners. Another of the biggest tragedies to befall mining in the Valley was the explosion at the Thomas Coal Mine in Nacmine on June 18, 1934. It was mine rescue, under the supervision of Jack Hooks, who undertook the grisly and dangerous task of investigating what had happened to the miners who were caught in the mine during the blast. The rescue team found the bodies of Ivor Jones, Alex McLeod, and Hugh McDougall. McDougall and McLeod were closest to the explosion along with William Thomas and Louis Auger who survived. Jones was furthest away. Jones is a paramount example of the heroism that it took to risk yourself to help your fellow miners. Jones rushed to the aid of the four others and was twice overcome by gas inhalation. J. Thomson and two other miners who heard the explosion and came to offer aid dragged Jones back to safety each time. The gas was slowly overtaking the three men who came down to help realized they could not hold out much longer and they retreated before it was too late. Jones persisted and perished in an effort to save his fellow miners. Not all rescue attempts ended in tragedy and many lives were saved as a result of the heroic efforts of the mine rescue teams. A bizarre incident occurred at the Atlas #3 in 1951. A rockfall buried Joseph Gyoerick, 37, who was a timberman at the mine. Rockfalls were not rare in the mining business and mine rescue was called to extricate Gyoerick from his earthen prison. When mine rescue reached Gyoerick they thought he had perished under the debris and subsequently sent him to the morgue. The next day was quite a shock to Gyoerick as he found himself in the morgue, alive and confused as to what happened. He did need several back surgeries as a result of the accident, but, thanks to mine rescue, lived until to the age of 76, which just over doubled his lifespan from his first “death”. 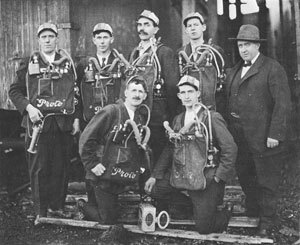 Mine rescue could not always make it to the scene of an accident and to the average miner, the nearest co-worker was the closest aid to be found. Eric Houghton, a motorman at the Atlas Coal Mine was checking on the cars he was hauling, whilst walking on top of them, when he slipped on the hitch of the last car. He fell with his legs over the mine tracks. Houghton couldn’t move in time to avoid an incoming train and the coal cars ran over his legs and then pinned his legs to his chest which prevented him from breathing. Abe, the brakeman, and the Fireboss rushed to Houghton’s aid and were able to lift the coal cars away and pull Houghton to safety, although there was still a long road to recovery. The mines could be dangerous. The records are full of accounts of accidents, rockfalls, and the occasional explosion. It was a blessing that the miners had the heroic mine rescue teams and each other to watch their backs and help when lives were on the line.